…One of the people working at the aforementioned library is a woman called Orla Payne who is obsessed with the unexplained disappearance of her brother Callum 20 years earlier, when he was a teenager. Their Uncle Phillip was interviewed regarding Callum’s disappearance but before any formal charges could be laid Phillip’s body was found in the Hanging Wood. Everyone in the community assumed it was a suicide and took this as evidence of Phillip’s guilt in Callum’s disappearance and probable death, although the boy’s body was never found. All these years later Orla tells Daniel she believes Callum to still be alive though her reasons for thinking this way are unclear, clouded by her alcohol induced fog. Unsuccessful in her attempts to make Hannah Scarlett reopen the case Orla then dies in grim circumstances herself, an event which does prompt a somewhat reluctant review of the case of Callum’s disappearance. One of Edwards’ strengths as a writer is his ability to quickly draw the reader in to the worlds he creates, making you feel as if you are part of the things and observing the shenanigans from a close vantage point. He achieves this through thoughtful character depictions and just the right amount of detail about the local environment, events and people. Each time I return to Martin Edwards’ Lake District (this is my fourth visit) I feel like I’m coming back to a place I know (helped along in this instance by the inclusion of a small map which I very much appreciated and would like to see more of). Another of the enjoyable features of this series is that there’s a nice balance between old and new characters. Of course there are the two long-running series protagonists in DCI Hannah Scarlett and historian Daniel Kind but there are always lots of new characters to meet in depth for each new story. Most of the players in this particular drama belong to one of two prominent families in the area and the reader is soon gripped by their various connections and shared histories. Because Hannah and Daniel don’t have to carry the entire narrative Edwards has been able to tease out their personalities and foibles over time. Even here, five books into the series, we learn new things about each one which is a boon for fans of the series (for those wondering about the hint of romance between the two glimpsed in previous novels you’ll have to read for yourselves to find out if there is any progress). The story here is first rate too, both intriguing and credible. It relies on a careful unravelling of the layers of small (and not-so-small) deceits that the characters have told about themselves (or to themselves) over time. Of course all the characters have engaged in this behaviour, not just the criminally inclined, because it’s natural for humans to re-invent themselves via the stories and events from their pasts that they choose to share in their present. Sometimes it’s nothing more than cutting out the boring bits of one’s life story and sometimes it’s a little more sinister but we all do it and Edwards has depicted it very intelligently and believably here. There were several points at which I had that smug ‘oh I’ve worked this bit out’ feeling only to realise it was a minor tangent to the main story or, worse, to have an unpredicted twist foil my puzzle solving attempts. Some crime fiction always feels like fiction but with The Hanging Wood I wouldn’t have taken much convincing this was a true story unfolding. There’s not a single thing that couldn’t easily happen in the real world, from Orla’s grim death (my parents used to scare us with stories of just such a death when we visited our farming relatives each summer) to the events which were ultimately uncovered in connection with Callum’s disappearance. 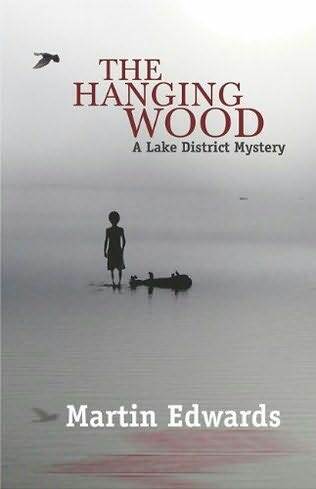 The Hanging Wood maintains the high standard of its predecessors in offering a classy, thoughtful and engaging story that is clearly a cut above the average in the crowded space of British police procedurals. The Hanging Wood was released in the US on April 6 2011 and is due for release in the UK in early July 2011. This entry was posted in book review, England, Martin Edwards. Bookmark the permalink. A fine review – and thank you for the link. Great review Bernadette! We just featured this book as our Curators Choice of the day for Police Procedural Mystery. Check out our Mystery Books website (http://www.curatedmysterybooks.com)! We feature a hand-selected collection of mystery books in specific sub-genres. What do you think of the selection? ?